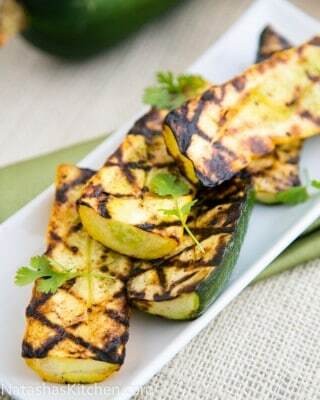 Grilling zucchini is so easy and it retains its natural meaty juiciness. Preheat your grill then adjust your temp to medium heat. In a small bowl, combine pressed garlic and 1/4 cup olive oil. Stir and set aside to let the garlic infuse into the oil while you finish your prep. Slice zucchini in half, then cut the zucchini in half again the long way so you get 4 equal pieces. Arrange them on a baking dish skin side down and score the top of each one with a knife about 1/4" to 1/2" deep (this will allow the oil to penetrate into the zucchini). Generously brush the garlic infused oil onto the zucchini (reserve leftover oil). Sprinkle with salt and freshly ground black pepper. Grill zucchini (seasoned side down) for a 5 min, then rotate (without flipping them over) to get the cool grill marks. Check them often to avoid scorching and adjust heat appropriately. Be careful as the oil can drip down and cause little flames to come up. My husband used a little water spray bottle to tame the flames. Flip the zucchini over so they are grilling skin side down. Grill the second side for about 4-5 min depending on the thickness of the vegetable and how well-done you want them to be. Re-brush the tops with reserved garlic infused oil and serve.